Q: On August 23, the White House released a statement on El Salvador's decision to establish diplomatic relations with Beijing, saying that this decision affects the economy and security of the entire Americas region. The El Salvadoran government's receptiveness to China's interference in the domestic politics of a western hemisphere country is of grave concern to the US, and will result in a reevaluation of the US relationship with El Salvador. The US will continue to oppose China's political interference in the Western Hemisphere. What is your comment? A: Yesterday I have made clear our stern position on opposing the US interference in the normal development of relations between other countries. I would like to reiterate that El Salvador established diplomatic ties with China on the basis of the one-China principle. It is a justified and aboveboard decision made without holding anything back. We urge the US to view this in an objective way. Before August 21, China had diplomatic relations with 25 countries in the Americas, including the US, and China has been working for, not against, regional development and security. After August 21, that number reached 26. In what way does that affect regional development and security? El Salvador chose to side with the UN and other 177 countries by recognizing the one-China principle and establishing diplomatic ties with China, which conforms with the trend of the times and the international situation, accords with international law and basic norms governing international relations, and serves the fundamental interests of China and El Salvador and the two peoples. Does not this finger-pointing by some country constitute interference in El Salvador's internal affairs? Who on earth is carrying out political interference in the region? The answer is obvious. Latin America and the Caribbean region is an independent and ever-growing force for economic globalization in a multi-polar world. Our advice for the relevant people is to show respect for other countries' independent right to determine their domestic and foreign affairs and stop hegemonistic behaviors. Q: You might have noticed that Australia has a new Prime Minister today, Mr. Scott Morrison. What is your view on Mr. Morrison? What would be the impact of his election on the China-Australia relations? A: We congratulate Mr. Morrison on becoming the Prime Minister of Australia. China's position on developing China-Australia relations is consistent and clear. A China-Australia relationship that grows in a sound and steady way serves the fundamental interests of the two peoples as well as regional and world peace, stability and prosperity. China stands ready to work with the new Australian government to move forward bilateral ties along the right track. Q: We have noticed that when referring to the current trade talks between China and the US, many senior US politicians have been talking about how good the US economic situation is and how badly China is faring. Do you have any response to this kind of viewpoint? A: We have said that China prefers no comment of this kind or other while talks are underway. The same is true when it comes to the trade talks between China and the US this time. If we sincerely want to get a good outcome, then we should talk without a cacophony of voices. We don't think it is necessary to resort to the loudspeaker every now and then just to boost one's morale. As for those senior US politicians who play down China's economic fundamentals and play up their own, we have noticed their remarks as well and we wonder who is their target audience. If they meant these words for the Chinese people, they should know that such efforts are futile and there is no point in doing this, as facts have proven. If they meant these words for their domestic audience, maybe they do feel the need to do so. Q: State Councilor and Foreign Minister Wang Yi is now on a visit to Mongolia. We have noted that the Mongolian leaders, when meeting with Wang Yi, all mentioned that the Mongolian side is committed to enhancing cooperation with China under the Belt and Road framework. Can you give us more details on this? A: State Councilor and Foreign Minister Wang Yi is now on an official visit to Mongolia. He has already met respectively with Mongolian President Khaltmaa Battulga and Chairman of the State Great Khural Miyeegombo Enkhbold and held talks with Foreign Minister Tsogtbaatar Damdin. According to my information, State Councilor and Foreign Minister Wang Yi will also meet with Prime Minister Ukhnaa Khurelsukh and senior officials from the five provinces in western Mongolia. The Chinese side will issue more information on the relevant events. You may continue to follow on that. Indeed, during the above-mentioned meetings and talks, the Mongolian leaders once again said that the Mongolian side is committed to promoting greater synergy between the Development Road Initiative and the Belt and Road Initiative, stepping up cooperation with China in infrastructure, energy and electricity and accelerating the implementation of the outline for the China-Mongolia-Russia economic corridor. State Councilor and Foreign Minister Wang Yi proposed China's propositions on jointly advancing the Belt and Road Initiative with Mongolia. Firstly, China supports Mongolia in speeding up the infrastructure building and breaking the development bottlenecks. Secondly, China supports Mongolia's greater efforts to improve people's livelihood so that the Mongolian people could reap tangible benefits through participating in the Belt and Road Initiative. Thirdly, greater importance should be attached to environmental protection and ecological conservation. We will join hands with Mongolia to build the green Silk Road. Fourthly, China will help Mongolia translate resources endowment into development advantages, achieve diversified development and enhance its capacity for independent and sustainable development. China and Mongolia are close neighbors, and Mongolia is a natural partner for jointly advancing the Belt and Road Initiative. In fact, Mongolia is one of the first countries to echo this initiative. 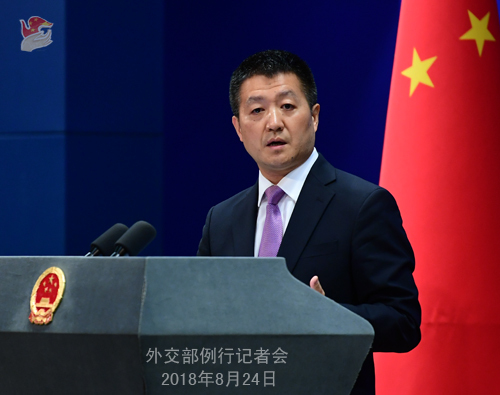 We are convinced that China and Mongolia jointly advancing the Belt and Road Initiative will provide new opportunities and open up new space for bilateral cooperation and inject strong impetus into our respective economic and social development as well as regional development and prosperity. Q: A US senator has said that he is preparing a legislation to force Taiwan allies to stay with Taiwan and not change their so-called "diplomatic ties" to China. Do you have any comment on this? A: While some US politicians are making these jarring noises on the establishment of diplomatic ties between China and El Salvador, the President and government of El Salvador have made public statements, declaring that their decision meets the trend of the times and the fundamental interests of the Salvadoran people. I am convinced that the Salvadoran people knows the best what is in their own interests. We hope that the relevant country could respect other sovereign states' right to choose and formulate their foreign policies and stop interfering in other countries' domestic affairs. 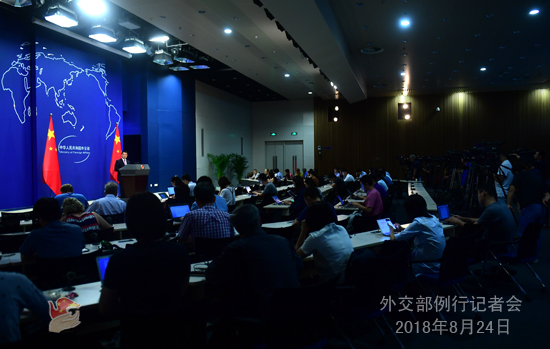 Q: Foreign media reported that neither China nor the US have high expectations for their trade talks, and they have no plan for further negotiations. Some Chinese officials even said that there will be no more trade talks between the two sides before the US mid-term election in November. Do you have more information on that? A: China and the US have all issued press readouts on the vice-ministerial trade talks in Washington. It is written clearly in the readout of the Chinese side that both sides will remain in touch with each other on the next-step arrangements. I have no more information to offer other than that. Q: It is reported that on August 23, the US Air Force flew B-52 bombers over the East China Sea Air Defense Identification Zone. Can you confirm it? What is your comment? A: I am not aware of the details. I would refer you to the Defense Ministry. In principle, we hope that actions taken in this region by any country could help enhance mutual trust and show respect for the legitimate security interests of regional countries. Nothing that undermines mutual trust and regional security and stability shall happen. 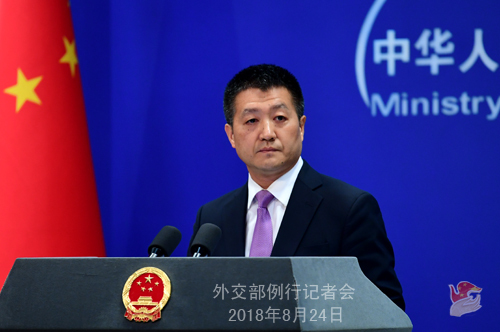 Q: After the Chinese Foreign Ministry declined to renew the visa for the Buzzfeed Beijing Bureau chief, the US Embassy in Beijing said on August 24 that it was deeply concerned about the treatment of foreign and domestic journalists in China. Does the Foreign Ministry have any comment? A: I have noted relevant reports. The US Embassy in China should observe the Vienna Convention on Diplomatic Relations and refrain from doing anything that disagrees with its status or interferes in other countries' internal affairs. As for this journalist mentioned by the US Embassy, I said yesterday that she is not a resident correspondent in China. As for the issuance of visas for ordinary citizens, the US Embassy must know all too well the international practices.